Happy New Year everyone! Hope everybody had a sweet and cheerful start to the year 2011. Today I'm posting my our first bake of the year 2011. It was a joint project between me & DD and it seems with her touch cookies came out nice & perfect and almost one third were gone before the end of the day. I don't bake cookies very often so other day when we decided to bake sugar cookies I could not find my recipe(I still have many recipes on piece of papers). 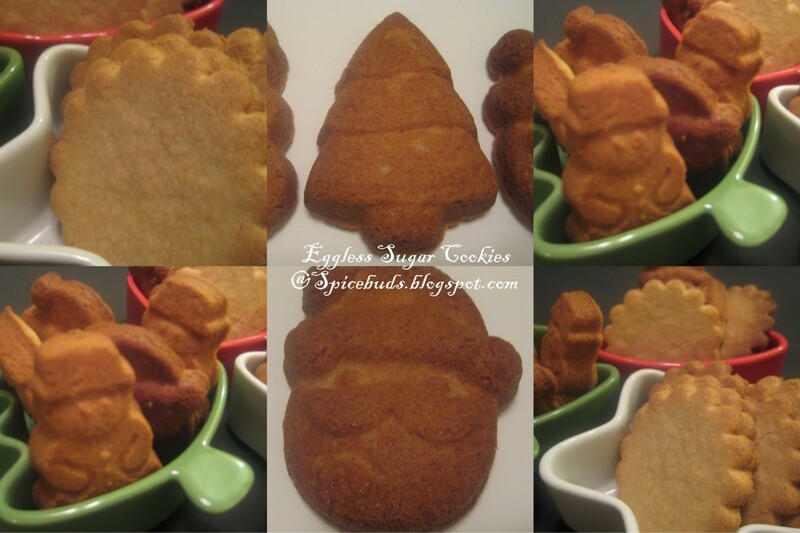 So I googled for Egg less Sugar Cookies & I found Aparna's(My Diverse Kitchen) recipe who has further adapted from Slashfood and before I looked at the recipe, the picture of her cookies convinced me that I have to make these. She has decorated them so beautifully, that cookies look like a piece of art. I'm sure many of you must have seen those already at her blog but for those who haven't here's the link. I haven't decorated mine, didn't had that much of time, but they taste good as is and good thing is she substituted 2/3 rd of the all purpose flour with whole wheat flour in this recipe. Another best part is dough doesn't need to rest in the fridge for this recipe so it's Mix, Roll, Cut & Bake. Took us around 20 minutes in total(including baking time) we used half of the recipe & baked around 22 cookies pretty generous size. Out of 22 cookies 12 were baked in the cookie pan with x'mas shapes and these were little more thick than regular rolled ones. Though I have not changed the recipe other than using whole wheat pastry flour instead of regular whole wheat flour but I'm still going to write down the recipe as I said I halved the recipe and to avoid doing calculations again next time I think it's better to write down. Sift together all the dry ingredients : flours, baking powder & salt. Keep it aside. Cream butter & sugar till smooth. Add milk & vanilla combine everything together. You can use mixer for this step. I use to do this with regular whisk but this time I used stand mixer. Add dry ingredients to the wet in batches & mix with hands till everything comes together as a dough. If it's crumbly & not coming together add a tsp. of milk & knead it for few seconds only(see Notes).Make 2 balls out of it. Roll the dough ball into 1/4 inch thick sheet, cut out the shapes U want. Place the cookies on ungreased cookie sheet. Pick rest of the dough which is left after cut outs again make a ball of it & roll it, cut out the cookies, continue till U have no more dough left. Bake for 10-12 minutes in pre heated oven at 350 degree F.Mine were done in 11 minutes, next time may be I'll take cookie pan out of the oven 1 or 2 minutes early as the bottom side got little dark(no change in the taste--it was good) I guess because pan was dark color. But the cookies in the cookie sheet came out good in 11 minutes. Let the pan/sheet get little cool, invert the cookies on to the rack. Once completely cool store in the air tight container preferably in the lock if U r planning to decorate them later, as the chances are you won't find them when you need them, they are that good.....if U don't believe me check out at Aparna's blog she also baked it again for decorating. We still have some left as DD choose to take them in her lunch box as dessert, school is opening back tomorrow and I'm very much sure that's gonna be part of her "Share your story/experience from the holidays" discussion. Liquid for this recipe, that is milk, is suggested 1 & 1/2 to 2 & 1/2 tablespoon, I used 2 & 1/2 tablespoon and dough came out together perfectly. Every time quantity of milk used can vary, so it's better to start with minimum liquid suggested & add little bit at a time as needed. These cookies are off to Champa for her weekly bake-off & also to Suma who's hosting a giveaway of "The Cake Bible" by Rose Levy Beranbaum for her first blog anniversary celebration. Happy New Year to u too!! I have seen Aparna's cookies and she has really done it beautifully.. Ur cookies look cute too, good ones to decorate for kids. Thanks for the entry to my event! Cute and damn pretty looking cookies, i dont bother to munch some rite now..
beautiful cookies and love the shapes. cute shape of the bowl n cookies.. happy 2011..
What a fun project for you and your dd. Your cookies turned out really nice. Happy 2011 to you too:) And congratulations on your baking jouney in 2011,it is already a tremendous start :) Loved all the shapes and the use of whole wheat flour.They look so festive!!! I'm happy to see that these cookies turned so good for you too. They lok really good, and they're great cookies even without the sugar decorations. Excellent shaped cookies. Avery nice way to start the New Year. This is something my gals would love :-) a sweet start to the year to you too. Cookies look yummy,How r u doing ?